1) Beignets: These simple doughnuts topped with icing sugar are way better than anything you’ll find at a Dunkin Doughnuts or Tim Hortons (most likely because they’re made fresh, in-house, using real ingredients)…and they’re available 24/7 at Café du Monde! The coffee’s good too. 2) Gulf Shrimp: Although there are a number of species of shrimp found in the Gulf of Mexico, the majority of shrimp landed in Louisiana are either White shrimp or Brown shrimp. According to the Louisiana Seafood website, the differences between white and brown shrimp, especially while they are small, are slight, so I won’t bother distinguishing between them. 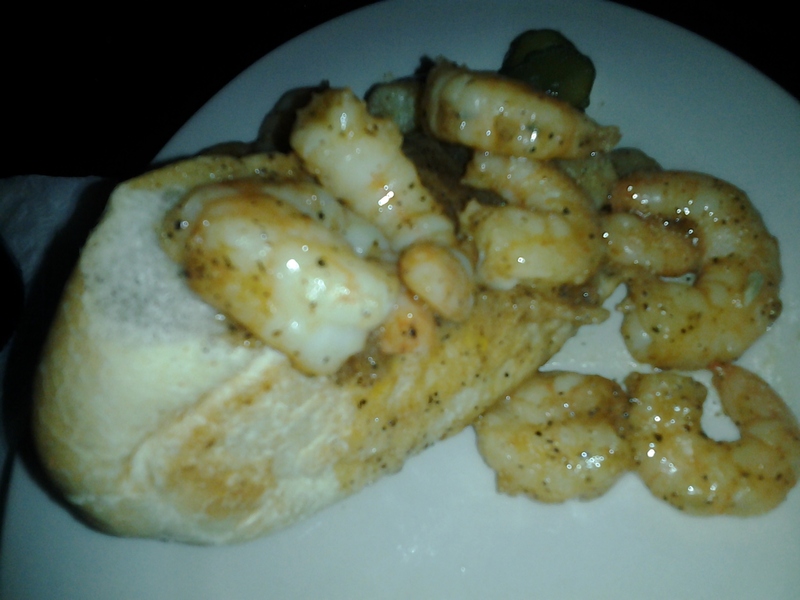 The shrimp are slightly sweet with a firm, resilient flesh. Though there are concerns associated with the way these wild shrimp are caught (due to bycatch and such), they are definitely better than any shrimp coming out of Asia. They are classified by seachoice as a “good alternative”. However, be sure to ask about where the shrimp come from…because although we were told by one restaurant that they ‘don’t do imported shrimp in NO’, another (high-end) restaurant was that we went to was in fact serving shrimp from Thailand. Shrimp in New Orleans are often served “BBQ” style- which there means they are cooked simply with salt and pepper, in a sauce made mostly of their own juices, and are neither cooked on a barbacue, nor grilled. They can then either be served on their own, in their cooking liquid, or in a po boy sandwich or somesuch. 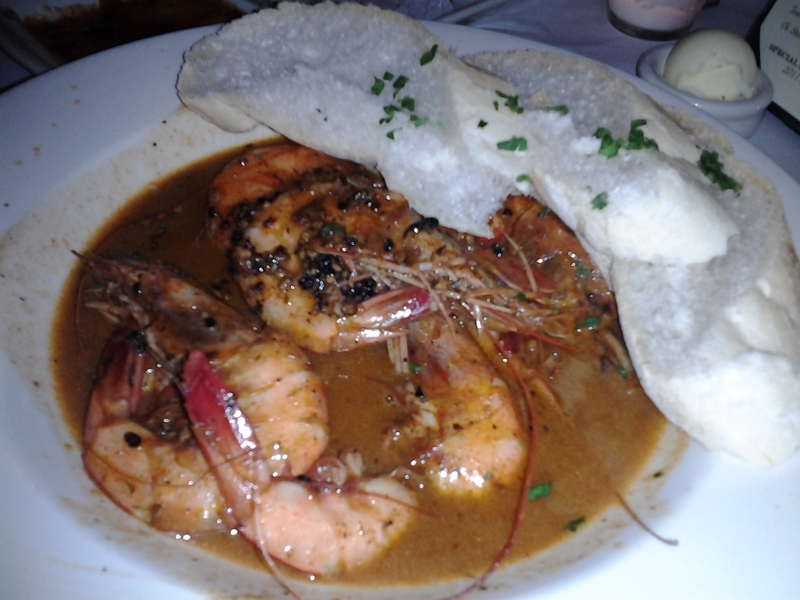 The BBQ shrimp that I ate at Mr. B’s Bistro were amazing; they are served in a rich, savoury sauce, which I’m certain contains quite a lot of butter. As they are served in their shells, eating them is quite a production, involving bibs and finger bowls, but don’t worry…the staff will take care of you. I enjoyed the shrimp po boy I had at Luizza’s By The Track as well, in spite of the fact that the shrimp were not deveined (okay, I know that it’s a diner, and they were small shrimp, but is that normal?). There was quite a bit of black pepper on the shrimp, but besides that, they were simply seasoned, allowing the fresh flavour of the crustaceans to shine through. On a note related to this post (though sort of unrelated to gulf shrimp), I’m not sure I get the appeal of the po boy sandwich. Okay, maybe I’m a bit spoiled, since I’m from Montreal and have thus been surrounded by a wide variety of delicious, flavourful, and diverse types of bread for my entire life, but the bread that I ate in New Orleans was pretty unremarkable, including the buns used to make the po boy sandwiches. It was like a pale, largely tasteless, imitation of french country-style bread. To make a great sandwich, you need good bread…right? 3) Bloody Maries: Okay, so these are more of a beverage…but they do, in New Orleans, at least, contain some food, usually olives and some mean pickled beans. Damn, they’re good…but they are quite spicy, even when you request medium spice. So, people who do not like/are not used to spice, be warned. 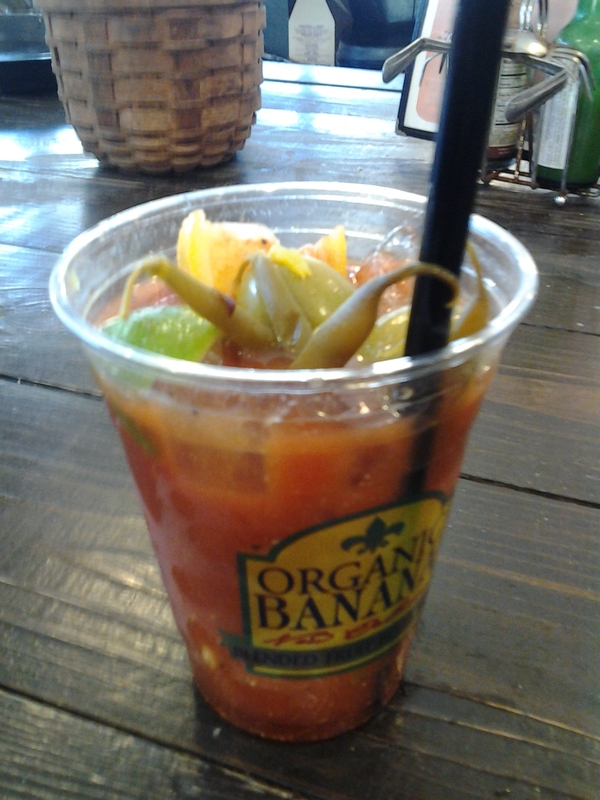 The best Bloody Mary I tried while in New Orleans was at Organic Banana at the French Market, and the second best was at Pat O’Briens; since coming home, I’ve tried recreating the drink, using Emiril’s recipe, and that worked out pretty well. I didn’t have any green beans on hand, but I did have some okra, and I quick-pickled it, using a Martha Stewart recipe. It worked out well. 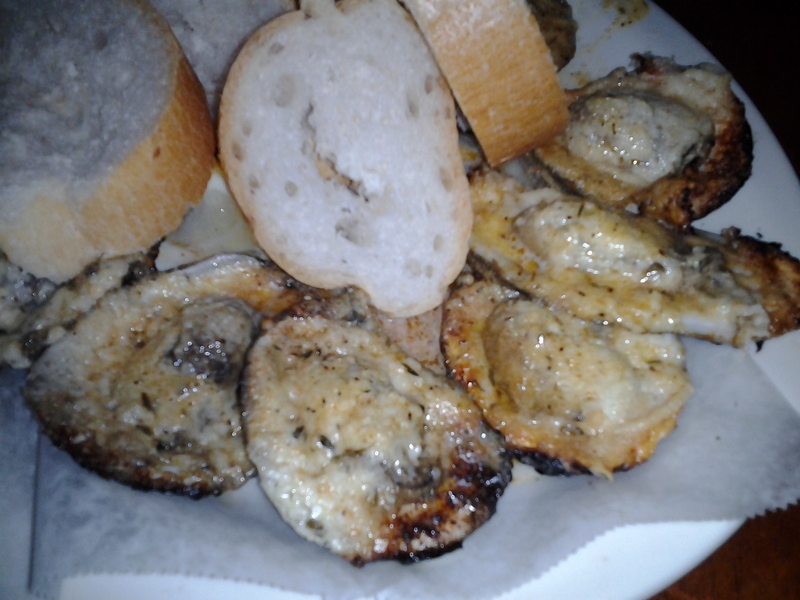 5) Charbroiled Oysters: a New Orleans speciality, these are oysters that have been cooked on a hot grill, in their shells, with butter, spices, and cheese (such as pecorino). I’ve found a recipe that looks good here, on Nola Cuisine. They’re very tasty, and are definitely worth a try. 6) Fresh Oysters! : I wouldn’t say my first taste of a raw oyster was love, but I have always enjoyed eating them. My shucking ability has certainly improved since then, as has my knowledge of the different types that are out there, and they do grow on you. If you’re a raw oyster fan, New Orleans is definitely the place to order up a few dozen, seeing as how it’s right on the Gulf of Mexico, and you’re likely to get some fresh and juicy specimens. 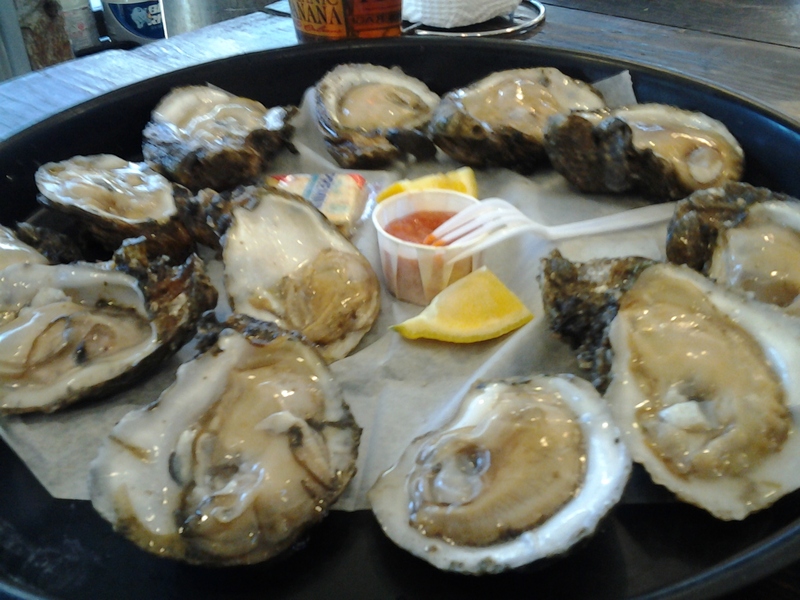 Whilst in New Orleans, we had fresh oysters at both Acme Oyster House and at J’s Seafood Dock at the French Market. The oysters were fresh and good at both places, but I found the experience over at J’s Seafood Dock, where you can sit outside and chill while you dine on your freshly shucked oysters, slightly more enjoyable. Also, you don’t have to wait in line, as you do at Acme Oyster House. 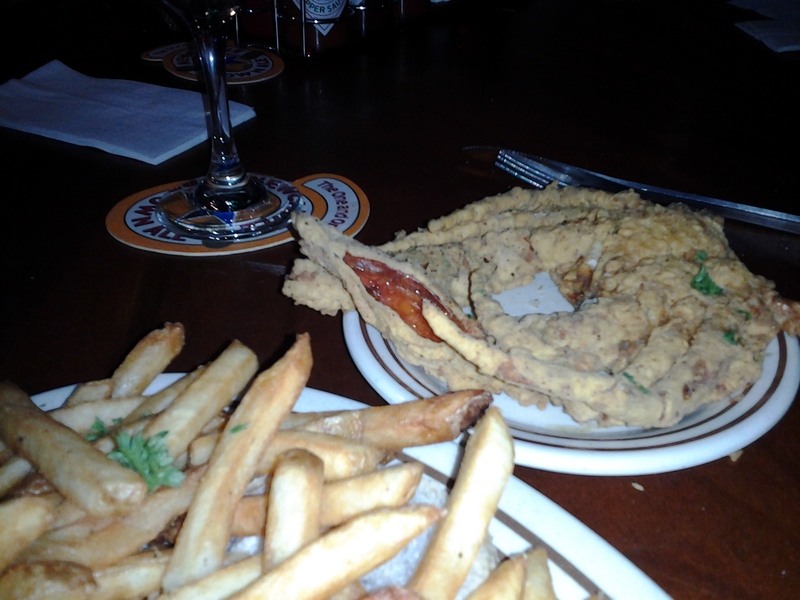 7) Soft Shell Crab: More seafood? Yes, and there’s still more to come. Soft shell crabs are crabs that have recently molted their hard shells, and can thus be eaten whole, shell and all. In Louisiana, blue crab, which is indigenous to the region, is the species used, and happily, stocks are well-managed, making this a pretty good choice sustainability-wise. They are usually served breaded and deep-fried. Mmmm…. 8) Crab Cakes: Louisiana blue crab can also be sampled in crab cake form. 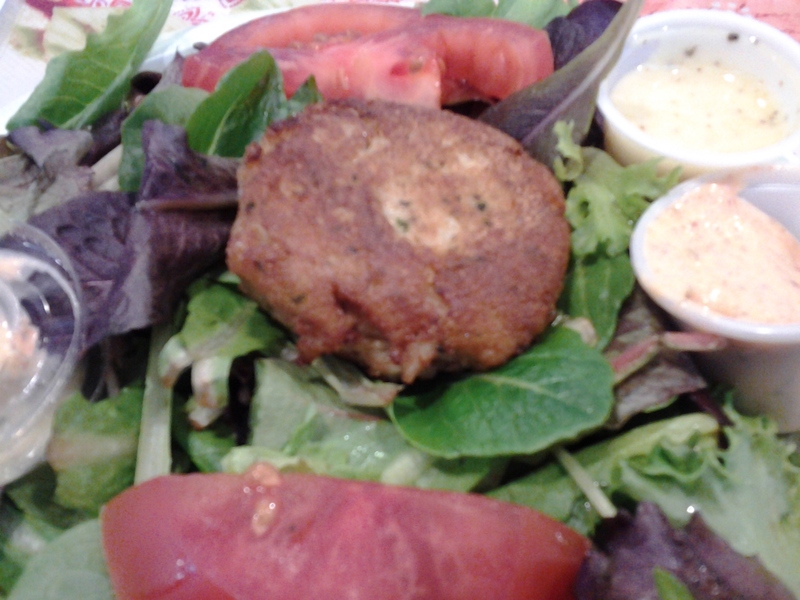 Meals From the Heart Cafe, also situated at the French Market, serve up some nice crab cakes, made with a high proportion of crab meat, and a lot of love. They offer vegetarian, vegan, and gluten-free dining options as well, and I have a lot of respect for their dedication to producing good, healthy food, something that seems to be pretty scarce over in New Orleans. 9) Soft Tacos: This may not be a food you would typically associate with New Orleans, but, on the other hand, the city was under Spanish rule for a while, so maybe that’s the reason for their taco-making prowess…or maybe that’s completely unrelated. In any case, both of my soft-taco experiences in this town were both memorable, and pleasurable. In fact, I have never tasted such amazing tacos! The night of our arrival in New Orleans, we headed over to SoBou, a tapas-style resto, and ordered, amoung other things, the crispy oyster taco. Though the oysters were rather underwhelming, the freshness of the taco itself, and the zesty and flavourful accompaniments, made this a memorable dish. 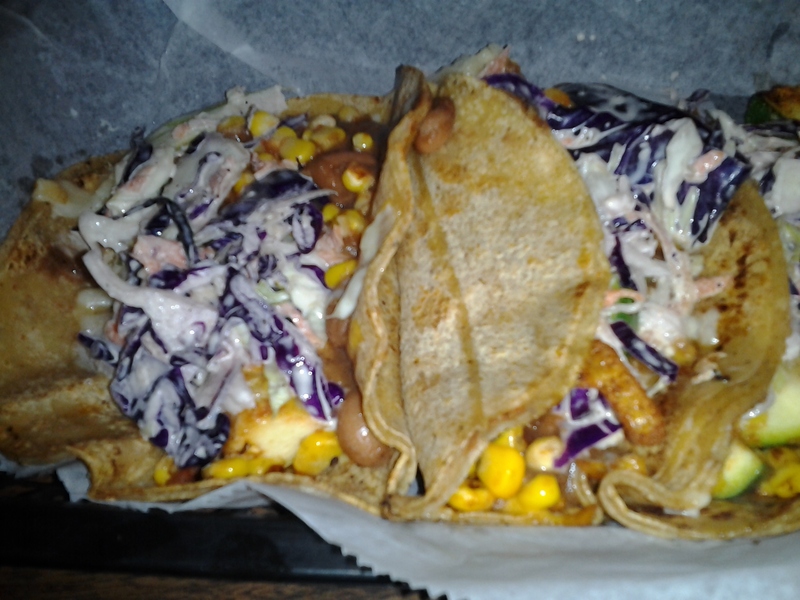 At Juan’s Flying Burrito, the tacos were even better! There were also a ton of vegetarian options. Awesome! 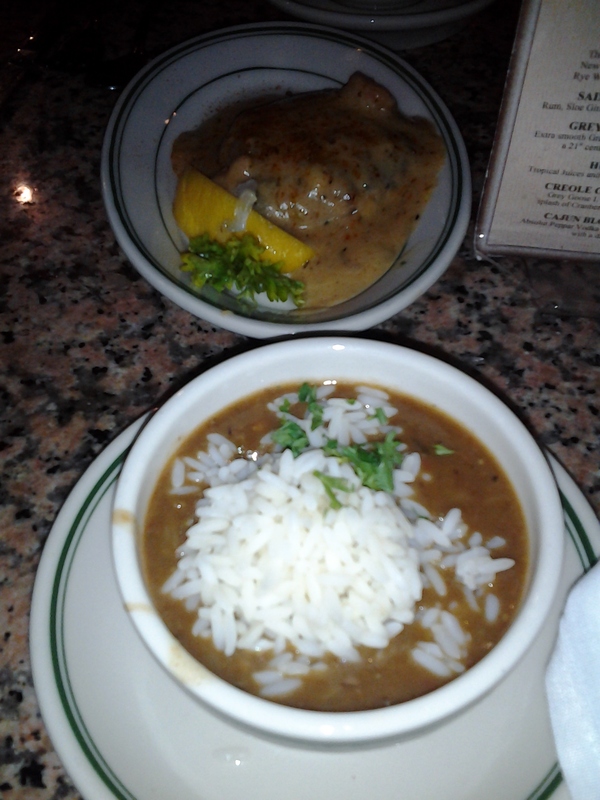 10) Gumbo: Obviously, the place to try gumbo is New Orleans. This rich stew comes in a number of different varieties. There are seafood gumbos, vegetable gumbos, and meat-based gumbos (chicken and sausage is a popular combo). Prior to my trip to New Orleans, I had often made vegetable gumbos at home, but obviously, while I was there, I wanted to try an authentic version of the stew. So, I tried a few different gumbos, both at The GumboShop and at Mr. B’s Bistro. I was impressed by the complex, and rich flavours of the stews at both restaurants, which likely can be attributed to dark rouxes and long, slow cooking, as well as by good stock. Some things you may think are missing from this list: po boys (which we’ve already been over), alligator, muffuletta, and pralines. 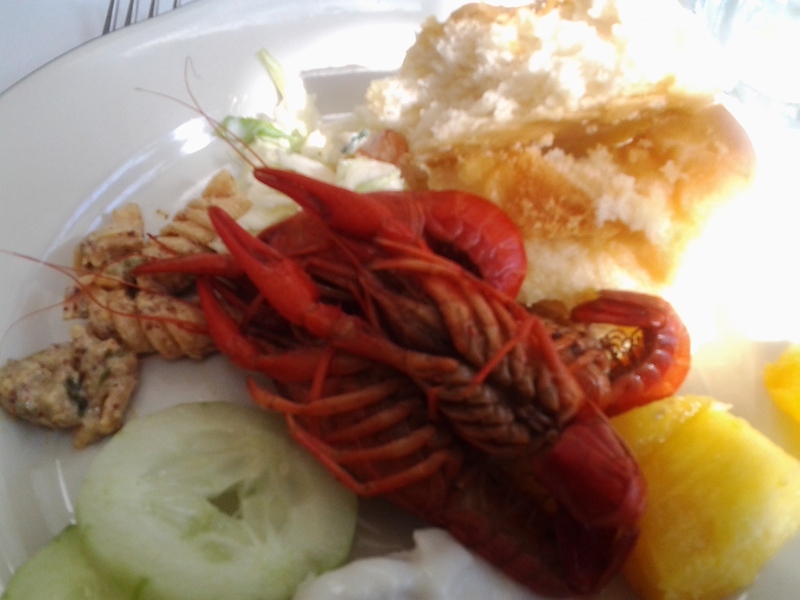 I did try alligator in New Orleans, and it was good. However, it was breaded and deep-fried, and I didn’t find it particularly remarkable, so, for that reason, I have not included it here. As for the muffuletta sandwich- well, that’s a meat-based sandwich, and I don’t eat meat, so…I don’t really feel equipped to review the sandwich…try it if you like! As for the pralines…I did try some pralines while I was in New Orleans, and they were good, but I am not an aficionado, and I actually enjoyed some of the other sugary treats we tried over there more, so…if you like pralines, feel free to try some over there. Well written review. Okay,,,,,I’m hungry now. Want to get me some of that Gumbo!! I am curious to know what the range of prices are per meal. 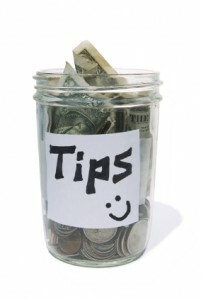 The price range per meal varies widely based on the type of restaurant and what you order, but as a general rule I would say expect to pay a minimum of $15, not including drinks or tip.